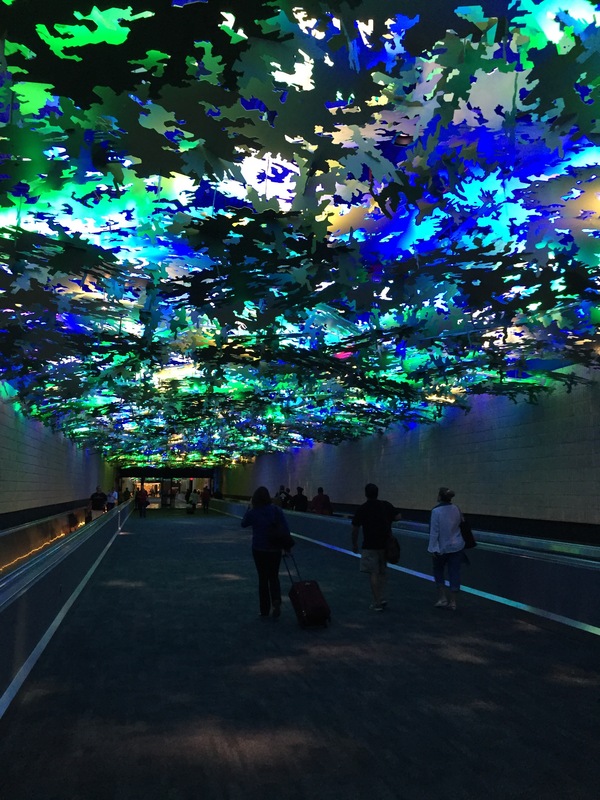 Walking from Concourse B to Concourse A at the Atlanta airport takes you through this walkway, which features leaf-like objects overhead, subdued lighting, and the sounds of a swamp. At least, I think it’s supposed to be a swamp, complete with croaking frogs, buzzing insects, and chirping birds. It’s a nice change of pace between bright, bustling concourses. Just another reason to walk the big airports, rather than jamming onto generic underground trams with a hundred of your closest friends. The Metropolitan Opera cancelled the last act of its performance of Rossini’s classic opera Guillaume Tell on Saturday afternoon because an audience member spread what police believed were cremated remains into the orchestra pit during intermission. 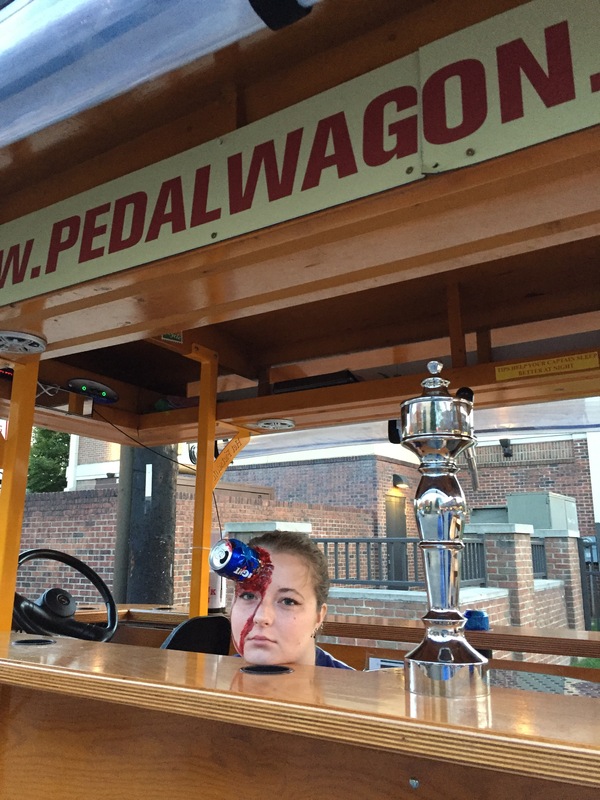 The opera to be performed on Saturday night also was cancelled as a result of the incident. According to the New York Times, a man in attendance told other audience members that he was at the opera to spread the ashes of his mentor. During the second intermission, the man was seen reaching into a black bag and sprinkling a powdery substance into two parts of the orchestra pit — which caused the cancellation of the rest of the opera because the powder was viewed as a potential threat and was subjected to testing. The man apparently has been identified through video surveillance footage, and police are trying to reach him. A follow-up story in the Times identifies the man, who apparently has posted on his Facebook page that he plans to leave some of the ashes at every opera house he and his mentor have visited. Apparently, spreading cremated remains in a place like the orchestra pit at the Metropolitan Opera isn’t a per se offense under New York law — at least, if you aren’t acting with criminal intent — but rather is simply a health code violation. It’s weird to think that someone would decide that it was appropriate to spread cremated remains in the midst of an actual performance of an opera — or for that matter, any live event, whether it’s a football game or a rock concert. It’s pretty selfish, too, when you think about it. This guy’s mentor evidently was an opera lover, and yet the act of spreading his ashes caused opera performances to be cancelled. If I were one of the people holding tickets to a performance that was cancelled — especially if I’d travelled from out of state to see the Met — I’d be furious. We have a “junk mail” filter at work. Most of the time, the filter just moves what is obvious spam into a “junk mail” folder without me looking at the email or doing anything to it. Of course, I didn’t try to open that spammy email . . . but I have to admit I was sorely tempted. Aren’t you curious about what income-tripling tips “Trump” might offer? Tips like: Be sure to inherit millions from your parents? Become a reality TV show star? Contribute to the political campaigns of every candidate for every office, regardless of their party affiliation, so you have ready access to the levers of power? Make liberal use of the American bankruptcy laws? Invest in “Man Tan” franchises? I guess I’m surprised that they sell political t-shirts at Reagan National Airport — but they do. There, side by side, you will find Hillary and Trump shirts and other paraphernalia. So, if you haven’t already gotten your political fix just by being in D.C., you can buy a t-shirt on your way home to publicly proclaim your loyalty. 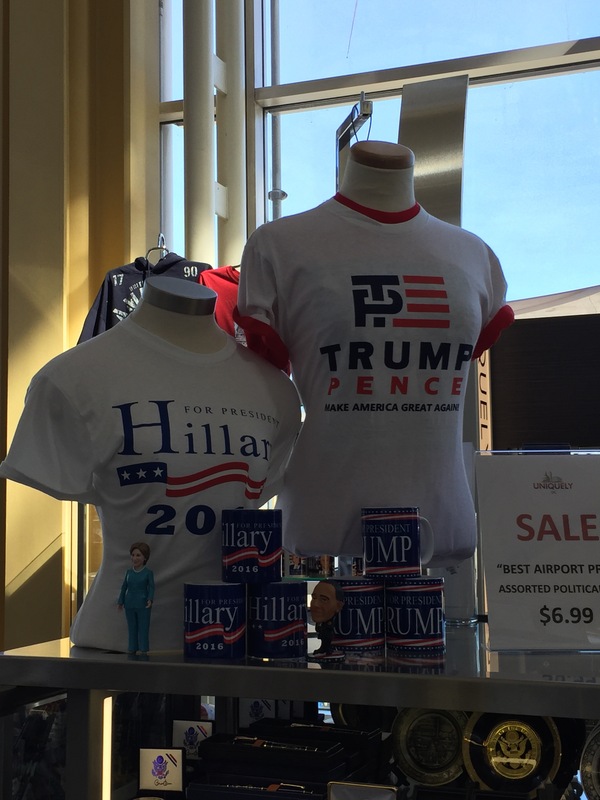 The cashier reports that the Hillary t-shirts are outselling the Trump t-shirts by a considerable margin.